Jenny and Susan have earned the nationally recognized Short Sales and Foreclosure Resource certification. The National Association of REALTORS® offers the SFR certification to REALTORS® who want to help both buyers and sellers navigate these complicated transactions, as demand for professional expertise with distressed sales grows. According to a recent NAR survey, nearly one-third of all existing homes sold recently were either short sales or foreclosures. 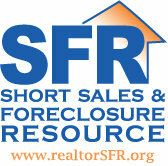 For many real estate professionals, short sales and foreclosures are the new “traditional” transaction. REALTORS® who have earned the SFR certification know how to help sellers maneuver the complexities of short sales as well as help buyers pursue short sale and foreclosure opportunities.